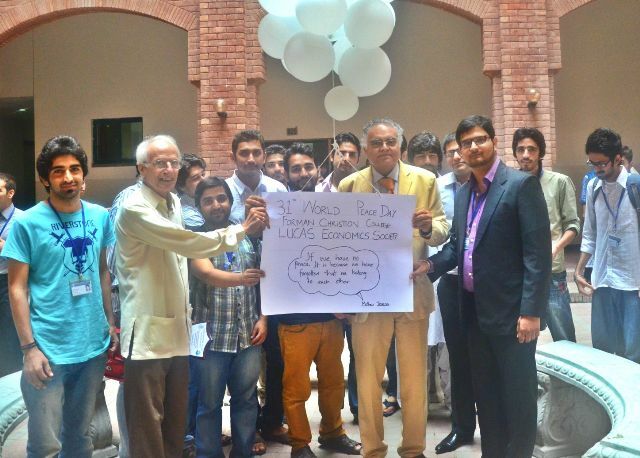 In accordance with the 31st International Peace Day, the Lucas Economics Society (LES) arranged a lecture titled “Prosperity through Peace-Options for Indo-Pak Economic Relations” on 26 September, 2013. The purpose behind the lecture was to explore new dimensions of economic relations between India and Pakistan, which at this crucial time of their history is essential for the survival and progress of both nations, especially in view of the recent economic challenges faced by them. Peace between India and Pakistan is believed to be the determinant of the economic success of the entire South East Asian region. 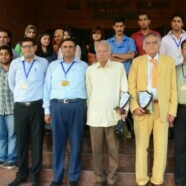 To talk on the occasion two very eminent personalities, Mr Mehdi Hassan and Dr Akmal Husain Professor of Economics at FCC, were invited. The event began with the recitation of the Holy Quran and the Holy bible. Dr Akmal Husain was called on stage first to address the audience on the topic through economic perspective. 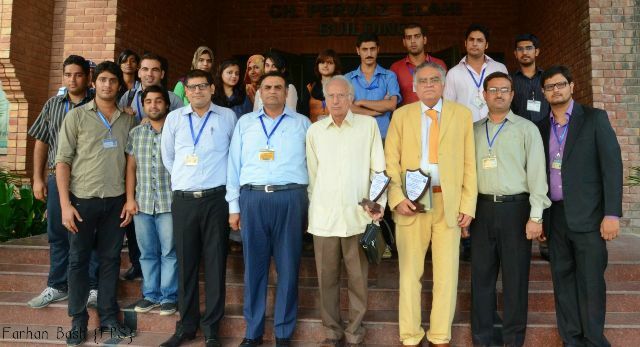 Dr Akmal Husain is a renowned economist who has made remarkable contributions to development economics. 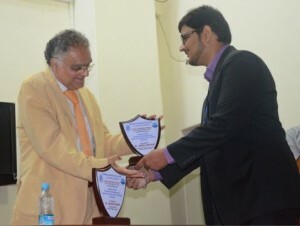 Dr Akmal Husain focused his lecture on three major points, terrorism and the probability of nuclear war between India and Pakistan, climatic change causing economic problems and critical water scarcity issue concerning both countries. First by concentrating solely on Pakistan he said, like India and China that have emerged as great economic powers, Pakistan should also rethink its development economics and find ways of sustaining its growth rate. He said that we can do this by institutionally opening up to the middle and poor class of society, making them the actor and subjects of growth and investment in the country. Then moving to the terrorism and danger of nuclear war between India and Pakistan, he affirmed that establishing peace between both nations is imperative as it is being anticipated that even a minor nuclear missile exchange between the two neighbors would cost 25 million lives. He said that both the countries have non state actors whose sole purpose is to cause instability. They use water issue, hate speech and all other tactics possible to instigate a war. The only way to dodge such fate is through trade and economic interdependency which would bring good faith to both countries. Emphasizing the importance of climate change that has particularly challenged the Pakistani economy, he said that we need to cooperate and form new economic strategies not for progress but for our survival. 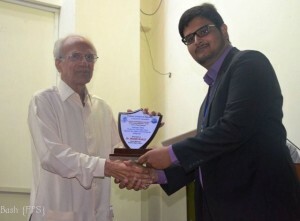 He supported his argument by quoting variability of monsoon, agricultural output, food availability, water flow and change in sea level statistics and their impacts from a UN climatic change survey report which indicates a struggling future for developing countries like Pakistan in absence of apt measures. Focusing on the water crises of South Asia, the gravest issue of present times, he said that Indus basin’s water availability is down to about 1000 cubic meters when the optimum level must be 1700 cubic meter which depicts that Indus basin already has a severe water shortage yet we waste most of our water. To deal with this issue he proposed three kinds of efficiencies; first, attaining maximum productivity out of the minimum available water. Since 67% of Pakistan’s water comes from India, he accentuated the need for better economic and political relations between India and Pakistan. He concluded his speech by saying that in past countries have dealt with similar survival issues through cooperation not conflict. Quoting Buleh shah he said, we should celebrate our diversity, transcend our ego and avoid hate speech. He suggested that by looking at others as a way to growth and economic development, we can hope to grow as a society and as a nation. Next Mr Mehdi Hassan was called on to speak. Mr Hassan is a historian, human rights activist as well as Dean and professor of mass communication department at BNU. He began his lecture by asserting that our problem as a nation is that we have a distorted account of history. Starting from the very foundation of this country up till now, all our text books are biased and teach history tailored for our own likeness, which he deems is the basis for our troubled relations with India. He asserted that Jinnah made a Pakistan tolerant of all religions but we changed that concept of Jinnah and after tempering with his ideology, we interpret it according to our will. We treat minorities with partiality. Moving on with the topic he said that we have impregnated a deep hatred in our public for India by declaring it our stark rival and a threat to our existence, which is a major hurdle in peace establishment. He sustained his argument by briefing about the historic events of all the major wars that Pakistan has fought with India since 1947 including the separation of East Pakistan, insinuating that Pakistan brought all the troubles on itself. Agreeing to Dr Akmal’s point that both countries have non state actors out of their control he said that we in Pakistan have many such radicals who exclaim that we did not make nuclear arsenals to display in glass showcases but to use them. He said that such people across both borders are the reason that peace could not be installed between both countries in as long 7 decades. At the end he said that despite everything he is optimistic and has high hopes of the new generation, which is better equipped with knowledge and education and is capable of making better decisions than its progeny. At the end the President of LES Raja Hashim presented honorary shield to the revered speakers.